Posted on Thu, Dec 29, 2011 : 5:59 a.m.
KENNER, La. — Forget the fact Virginia Tech has never played Michigan. It hasn't even faced a Big Ten team since 1993, when it beat Indiana in its only matchup against the conference. So, needless to say, the Hokies had to do a little head scratching when their Sugar Bowl matchup with the Wolverines was announced earlier this month. Virginia Tech wide receiver Danny Coale on Michigan's Denard Robinson-led offense: "When you think Big Ten, you kind of think powerful, and they have a quarterback that can run all over the place. So, they're not only powerful, but they're quick." But, now that the game is only five days away (8:30 p.m. Tuesday, ESPN), the Hokies have learned a thing or two about their counterpart through film study. 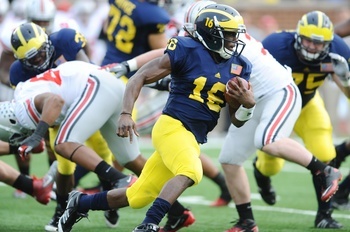 And, of course, that prep work starts with formulating a plan to stop quarterback Denard Robinson. But there's also more of a power-running game with tailback Fitz Toussaint, one of the fastest rising stars in the Big Ten. Robinson rushed for 1,307 yards and 16 touchdowns this season, and Toussaint added 1,059 yards and nine scores. They are only the second pair of backs to rush for 1,000 yards in the same season in school history, and the first since 1975. Together, they helped Michigan rank 12th nationally in rushing at 235.7 yards per game. That one-two punch belies what Virginia Tech was expecting to see from a Big Ten team. "When you think Big Ten, you kind of think powerful, and they have a quarterback that can run all over the place," Virginia Tech receiver Danny Coale said. "So, they’re not only powerful, but they’re quick. "It’s a unique team that I don’t think we’ve played all year long with the combination of size and speed." Something they have seen, though, is a mobile quarterback, and they have one of their own in Logan Thomas. Virginia Tech coach Frank Beamer has said that helps his team prepare to face a quarterback such as Robinson. Still, the Hokies know they'll have their hands full defending Michigan's dual-threat junior quarterback. "Some quarterbacks are hard to stop in open spaces," Beamer said. "I think this quarterback is hard to tackle in closed spaces. He’s special." A strong rushing attack starts with sound line play, and Beamer said one of the first things he noticed on film was Michigan's physical play at the line of scrimmage. "You look at this Michigan team, and the more you study them, the better they get," Beamer said. "They’re certainly well coached, but up front ... they're tough. "Up front is a strength for them. They perform well and it’s going to be a real challenge for us." The defensive line took a hit last week when starting tackle Will Heininger went down with a foot injury that has prevented him from practicing and is jeopardizing his status for the Sugar Bowl. He was seen at a Charlotte, N.C., airport en route to New Orleans with crutches and a boot on his right foot. Reserve defensive lineman Nathan Brink also has suffered an injury and already has been ruled out of the game. On the offensive side of the ball, Michigan coach Brady Hoke said there is a job battle brewing at left guard between Michael Schofield and Ricky Barnum. Schofield has started at that spot nine times this year while Barnum was suspended (one game) or hurt (eight games), but Barnum remains the listed starter on the depth chart and has played well when healthy. Toussaint and Robinson's success, though, is a testament to the success of Michigan's offensive line, regardless of who starts. "Their front’s huge," Coale said. "They’re enormous." Thu, Dec 29, 2011 : 5:38 p.m.
power, size and speed............. power- David Molk size- Al Borges? speed-D. Rob Put all three together.......Ivan Putski former WWF star! MEEEEEEEEEEEEEEEEEEEEEEANchigan football is once again in the lead!! As the rip though the hokies with size, power and speed!!! Special thanks to the polish hammer....Ivan Putski!! Thu, Dec 29, 2011 : 11:35 p.m. This is very funny stuff....hilarious ! Thu, Dec 29, 2011 : 5:33 p.m. I find it interesting when teams from different conferences with different styles get together for bowl games. It's fun to watch all the different matchups. One fatal mistake is to disrepect your opponent. U-M cannot afford to do that because Virginia Tech is a very good team that has been in the Top Ten for most of the year and currently still are ranked ahead of U-M. They are ranked that high for a reason -- because they are very good. Let's not fall in the same trap some of us did last year when we thought that U-M would defeat Mississippi State. Surely U-M oculdn't lose to a bunch of hicks whose fans go around ringing cowbells, right? Not only did U-M lose that game, but they got blown out 52-14 and a lot of the same key players in that game for U-M will be on the field for this year's Sugar Bowl. I hope U-M comes out on top in this year's Sugar Bowl but let's keep things in perspective and maintain a healthy respect for our opponent. I'm sure Virginia Tech has gained the respect of Brady Hoke and the rest of the team..
Thu, Dec 29, 2011 : 3:23 p.m.
MMM. Who recruited athletes with quickness and speed? I can't remember. Everything was bad about the last three years. wasn't it? Sat, Dec 31, 2011 : 7:52 p.m.
Thu, Dec 29, 2011 : 11:45 p.m.
DonAZ. Good post....I think the former Coach insults will die down in time, maybe by next fall. I too grow frustrated with the comments, and don't understand why news from AZ keeps making our page. I was inclined to snap back at those articles and a few delusional commenters who keep saying that coach should still be here while criticizing Hoke, but one day I just said enough ! We have a great thing going at Michigan, and all that counts is what we do now and in the future - and no one from up north, down south or 'king should be here' commenters count anymore. Thu, Dec 29, 2011 : 8:24 p.m.
Don and everybody--great posts and responses. Sums it up. Now, just to be fair, Molk and Koger were recruited by Carr's staff, as was Junior. They are a big part of our success. But power is not something anybody would have said about Michigan before this year. Thu, Dec 29, 2011 : 8:14 p.m.
Well said Don. Truth be told, I was excited about the hiring of RR back at the end of 07. That quickly deteriorated after realizing it was a bad fit all around and that Michigan was not going to WIN with that coaching staff. Winning is the most important thing. With the current staff and HC we get to win and do it with integrity and class. Brady Hoke just comes off as the most humble down to earth coach you could ask for. It seems he would step I'm front of a truck for his players. And they know that. In return they give him everything they have to give both in practice and in games. That translates to wins! It baffles me that any Michigan fan could be disappointed with the current coach, his staff, or the state of the football program. Thu, Dec 29, 2011 : 6:02 p.m.
DonAZ, I agree with everything you said, except the part about Borges &quot;matching&quot; the numbers from last year. Our O in 2011 exceeded the numbers from last year in overall points per game, and greatly exceeded the points per game against B1G opponents, especially the better B1G opponents. Thu, Dec 29, 2011 : 5 p.m. I couldn't have said it better, DonAZ. As a matter of fact, I probably wouldn't have been as nice as you. When you're dealing with blockheads who think either the spread offense is the end all and be all and that defense is an afterthought, or that if RR had one more year he'd have achieved the same results, it's difficult to be polite. (How's that for a sentence?!!!) RR recruited fairly well. It's his bad coaching that hindered those recruits from reaching their potential. Will Campbell is a prime example. Thu, Dec 29, 2011 : 4:41 p.m. I too grow weary. When we started 2011 the prior coach's supporters desperately hoped for a collapse under Hoke to justify their support. Michigan started 6-0 so that line of argument vanished. The obvious improvement in the defense was impossible to write off as an anomoly, so it was ignored. The focus became the offense. Next came the expectation of &quot;late season collapse&quot; to validate similar collapses by the prior coaching staff. But of course that didn't happen. If anything, the losses to MSU and Iowa served to bolster Michigan's resolve. Again, a complete reversal from the prior coach's performance. Late in the season the line of argument for the proponents of the prior coach's tenure was the supposed falloff of offensive output. But Borges essentially matched the numbers from last year *and* achieved more victories (because, after all, defense *does* matter). Further, with the emergence of Toussaint it became painfully evident that a balanced offensive attack has merits over last year's one-dimensional attack. So what remains is the rather weak argument about recruitment of this team's personnel. That the prior coach recruited most (but not all) of this team is inarguable. But what the change from the last three years to this year showed was the effect of coaching on the (a) fundamental techniques used and (b) the depth of commitment infused in the players. Last year both were lacking; this year the team possesses both in abundance. The top-5 recruiting class Hoke has lined up further undermines the notion of the prior coach's superiority in that area. The advocates of the prior regime really have little to nothing to stand on. The evidence of this season so clearly indicts the prior administration. So I do what I can to gently remind such advocates of the reality that hovers over the topic. Thu, Dec 29, 2011 : 4:13 p.m.
Wow. Don, thank you for your patience and logical/realistic approach to replying to such comments and opinions as these. I am glad you are able to continue to respond to the RR loyalists in a way that is not insulting. Quite frankly, I think most rational posters are so exhausted with such comments that they no longer have that ability. Me included. Thu, Dec 29, 2011 : 3:41 p.m.
RR recruited them. Strength and conditioning coach Aaron Wellman got them into proper Big 10 shape. Mattison coached them on proper and effective defensive techniques. Borges coached them on proper and effective offensive techniques. FYI ... &quot;everything was bad about the last three years&quot; is your creation, not others. &quot;Everything&quot; wasn't bad ... just the coaching. Thu, Dec 29, 2011 : 2:03 p.m.
Thu, Dec 29, 2011 : 9:14 p.m. I concur. I looked at VT's roster, and they have some rather large guys also. Just coach talk. Regardless, it should be an entertaining game. I can gurantee it won't be like the super-hyped LSU-Alabama game terminating in a 9-6 score.